Before I'm going to talk about Nicholas Sparks' The Choice let me give you some disclaimer and warning. Aside from this being the first post on The Shades of Grey that talks about a book, I actually have never written anything about a book. I, often, contemplate on how the story goes after reading them on my mind. So, if you had already guessed it, then yes, this is my first ever experiment of writing about such. different genres of books but usually love stories(of course), drama, mystery and suspense, and all others that fits to my mood and taste. Well going back, It was the first semester of my senior year since I last had a leisure reading and because of practice teaching to two different high schools and ALS*, numerous before-graduation-requirements, immediate-trip-to-Manila-after-graduation and work, I have not given time on this hobby of mine. Not to mention, my addiction to internet surfing and downloads when I bought my first laptop on that same year for our "research" class. But, you see, as much as movies and series have caught my interest, and internet caricatures have given me ample time to waste, I must say that I do really miss the company of a good book on a lazy afternoon, the late-night-reading-til-you-fall asleep- but-the-book-is-damn-good-so-you-finished-it-up-until-dawn-because-you-just-couldn't-get-enough and as what I usually describe it as the escape a book could only give from reality. Where the book came from. We bartered books with my co-worker when I knew she bought a P50 pesos book from a sale and the author was one of my fave. Well, some of you may not like such dramas that Nicholas Sparks bring, and the sad and unhappy endings that is predictably at its end but hopeless romantic as I am, I have a feel for these stories that mostly gives heartbreaks and, for me, lessons as well. Haha Which is one of the reasons I actually like it. You know, that gives me a note that life gives us heartbreaks but not for no reason at all. And that these pain and hurt help us grow maturely, teaches and makes us a learned person about life. 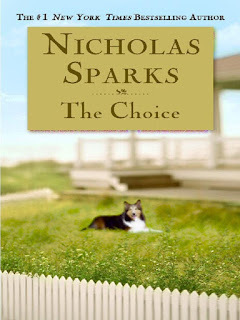 The Choice is a 2007 novel by acclaimed author Nicholas Sparks. The story is about Travis Parker and Gabby Holland's life as being neighbors to lovers. It has a captivating flashbacks of present to future of which the story evolves. And in the prologue, the present situation of their life was described which was somewhat miserable due to an unsaid source of problem. After which, their love story was vividly described and told. And off it went to the current situation where Travis is in the midst of choosing what is best about the conflict that they have. 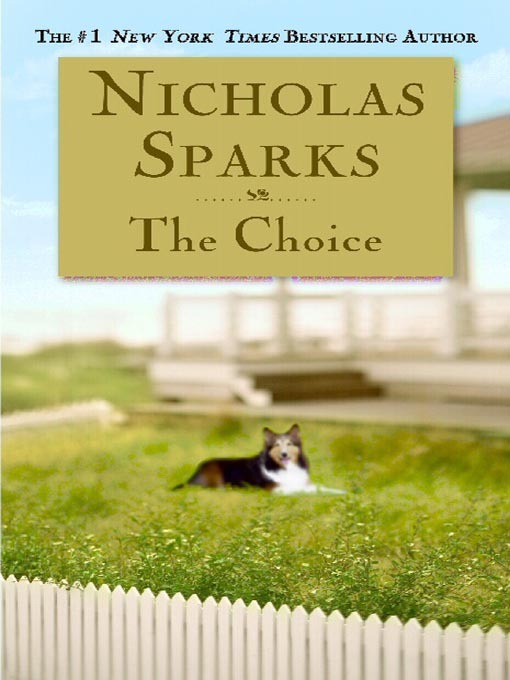 The Choice by Nicholas Sparks is indeed an emotional and inspiring love story. It is a story about overcoming barriers to be with your loved ones. And it only tells us that loving is not only about those sweet nothings and butterflies in our stomachs but also deciding and choosing the right decision for the person that we love no matter how difficult and discouraging the situation is. Quoted parts from Sparks' The Choice. There has been a long period of time during which he remembered being very happy. But things change. People change. Change was one of the inevitable laws of nature, exacting its toll on people's lives. Mistakes are made, regrets form, and all that was left were repercussions that made something as simple as rising from the bed seem almost laborious. But I am different now than I was then just like I was different at the end of the trip than I'd been at the beginning. And I'll be different tomorrow than I am today. And what it means is that I can never replicate a trip. Even if I went to the same places and meet the same people, it wouldn't be the same. My experience wouldn't be the same. To me, that's what traveling should be all about. Meeting people, learning to not only appreciate a different culture, but really enjoy it like a local, following whatever impulse strikes you. So how could I recommend a trip to someone else, if I don't even know what to expect? Poets would say that true love always ends in tragedy. How far should a person go in the name of love? Life, it seemed, was full of regret, and he yearned to turn back the clock so he could live parts of his life over again. *Alternative Learning System, a program in the Philippines wherein youth of 15 and above who weren't able to finish elementary and high school can actually take an alternative learning system that shortens elementary and high school learning to a year. After which, a student is assessed through examination and if he/she passed then one can have a diploma.